At the prolific pace Kevin Hart gets cast in movies, it's pretty hard to keep up with the world's highest-paid comedian. As the titles keep coming ("Untouchable," "Night School," "The Great Outdoors," "Ride Along 3"), persistent buzz surrounding one of Hart's upcoming movies has kept reboot fans and skeptics on edge. Even with a supercast of Hart, Dwayne Johnson and Jack Black, could a remake of "Jumanji" ever match or surpass the greatness of Robin Williams' 1995 fantasy adventure? Based on the trailer released Thursday, there's definite promise here. While the original film combined action and wholesome sentimentality, the latest interpretation of Chris Van Allsburg's 1981 picture book takes the high school genre as its jumping off point. The Hollywood stars are actually avatars of a mismatched group of teens who happened to pick up the game and select their characters, some more wisely than others. 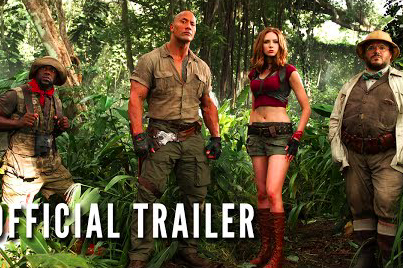 The best part about this trailer is the confirmed People's Eyebrow that will appear in "Jumanji: Welcome to the Jungle," which hits theaters just before Christmas on Dec. 22.